These high-tech instruments tell biologists what penguins get up to when they head out to the ocean to find food. To attach a splash tag to a penguin, biologists carefully glue the tag to the skin on the penguin's lower back, under the feathers. The glue holds tight, but eventually dissolves and causes no harm to the penguin. Splash tags are a few inches long, cylindrical, with an antenna that sticks out a little farther than the penguin's tail. Sensors at the tip of the antenna sample the water, recording the temperature, salinity, and depth the penguin is swimming at. 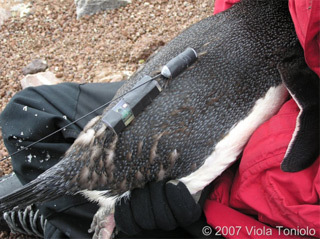 The tags record continuously for several days, tracking the penguin's movements. When the bird returns to land, the biologists catch it again and remove the band. The data stored in the tag lets scientists reconstruct the kinds of dives the bird made, as well as the currents it swam in.